Monday March 30th 1925 It was cold and I was out only to call of Joey Harmon. Spent evening with Mattie here at home. Wrote Hattie. 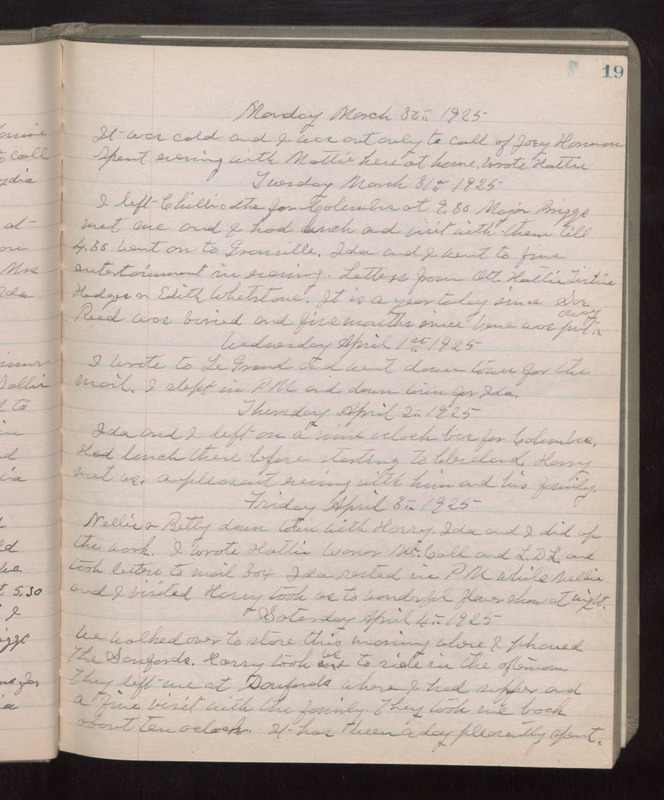 Tuesday March 31st 1925 I left Chillicothe for Columbus at 9.30. Major Briggs met me and I had lunch and visit with them till 4.35, went on to Granville. Ida and I went to fine entertainment in evening. Letters from Ott, Hattie, Tishie Hedges, & Edith Whetstone. It is a year today since Sue Reed was buried and five months since Vene was put away. Wednesday April 1st 1925 I wrote to LeGrand and went down town for the mail. I slept in PM and down town for Ida. Thursday April 2nd 1925 Ida and I left on a nine oclock bus for Columbus. Had lunch there before starting to Cleveland. Harry met us. A pleasant evening with him and his family. Friday April 3rd 1925 Nellie & Betty down town with Harry. Ida and I did up the work. I wrote Hattie, Warner McCall and L D L and took letters to mail box. I rested in PM while Nellie and I visited. Harry took us to wonderful flower show at night. Saturday April 4th 1925 We walked over to store this morning where I phoned The Sanfords. Harry took us to ride in the afternoon. They left me at Sanfords where I had supper and a fine visit with the family. They took me back about ten oclock. It has been a day pleasantly spent.